After the major release of Contextual Related Posts v2.2.0, I’ve spent quite a bit of time over the past few weeks working on v2.1.0 which brings together several bug fixes, some optimisation and many new features. If you’re using this plugin and looking for support, please do not post a comment below, but instead create a new thread in the WordPress.org support forum or create a new issue in Github. If you’re just upgraded the plugin, remember to clear the cache and even better, reset the plugin settings. Remember to save any custom CSS code that you might be using. I blogged about removing timthumb from my plugins several months ago after Ben stopped supporting the plugin. With Google announcing the shut down of Google Code, I believe this is the final nail in the coffin of an arguably amazing script. Contextual Related Posts v2.1.0 completely does away with timthumb. The settings have been removed and the script is no longer bundled. If you’re still looking to use timthumb on your site, you might want to consider self-hosting it. You can find the latest working version in the Github repository I created and the corresponding filter to hook it into Contextual Related Posts. If you’re looking for a replacement to timthumb, do check out OTF Regenerate Thumbnails. It’s designed to regenerate images on the fly! 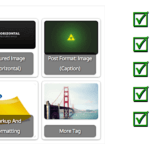 v2.0.0 came with preliminary support for WordPress’ inbuilt image sizes. However, the implementation wasn’t perfect. 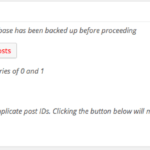 I first implemented this GUI in Top 10 v2.0 and have now replicated this within Contextual Related Posts v2.1.1. 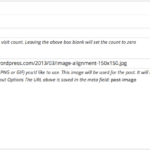 You can now select an inbuilt image size or just select a custom size. The default setting is 150×150 and cropped, which is what the default style uses. If you’re interested in translating Contextual Related Posts into your own language, do consider joining the WP Translations team and translate Contextual Related Posts on Transifex. If you’re a developer interested in writing a new feature or have identified a bug that you would like to get fixed, head over to Github, fork the plugin and send me a pull request. 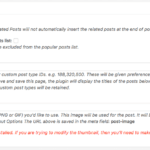 If you’ve been using Contextual Related Posts, do consider writing a good review of the plugin on the WordPress.org forum. Additionally, do consider a donation. Currently, that’s the only income that this plugin generates. If you’d like to suggest a feature you can quickly do so by creating a new issue in Github. I’ll also be focusing on developing a detailed knowledge base for this and my other plugins. I’ve been spending a while researching the best option to go and it might likely be a separate WordPress blog running a custom knowledge base theme. So go ahead and upgrade this plugin if you’re already using it. If you’re not, why aren’t you? 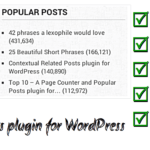 It’s the fastest related posts plugin in the WordPress universe and it’s completely free to use!